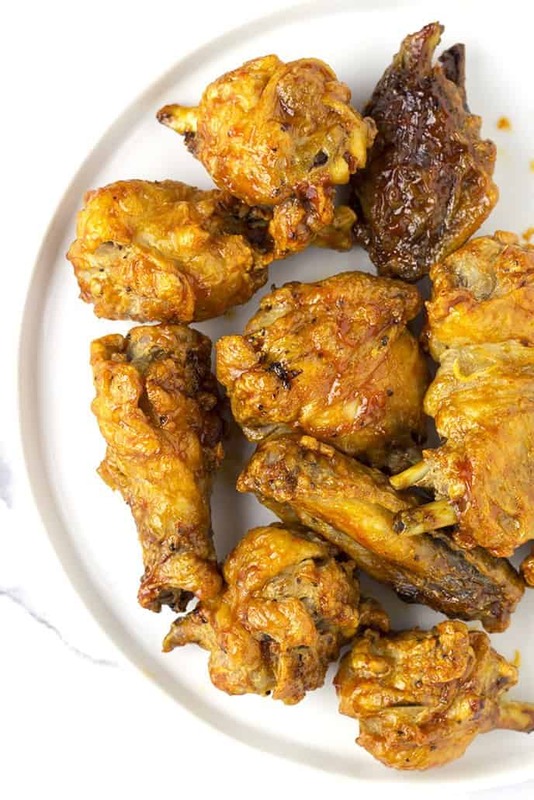 When you find yourself craving chicken, make this air fryer chicken wings recipe. It’s healthier, tastier, and quicker than calling the local takeout place. Bite into its crispiness smothered with sweet and spicy sauce. You can serve these as an appetizer or as a main dish. Forget the deep fryers and gallons of oil. No more oil splatters. 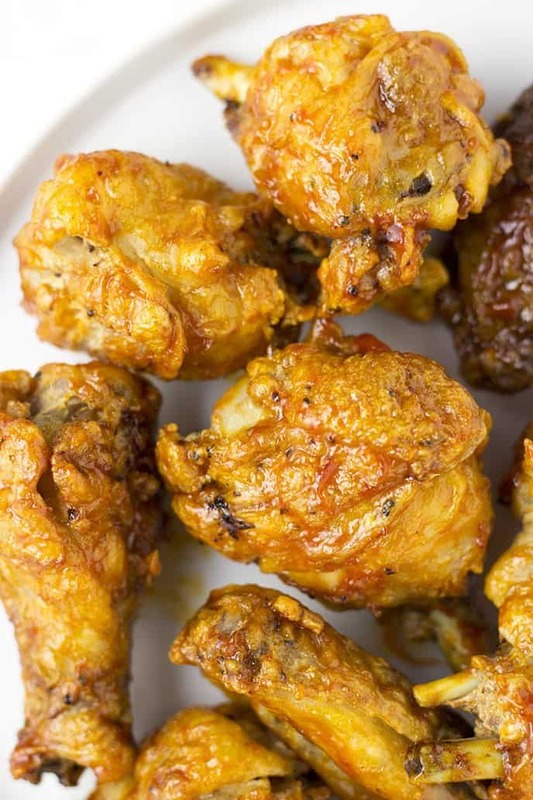 All you’ll need is an air fryer to fry these chicken wings into super crispy deliciousness. There is a variety of chicken wing recipes from a growing number of different flavors. However, it boils down to just 3 things in what makes truly delicious chicken wings. First is the crispiness of the chicken wings. They need to be crunchy without being overly burnt or done. I know there are some that prefer the soft and tender wings, but the majority loves the crunchiness when you bite into the wings. Second is the tenderness of the chicken wings. This is where most people fail when cooking wings. They either overcook it making the meat tough and dry or undercook it. The third is the sauce. Most would say this is the most important criteria of great chicken wings. When it comes to flavor whether it’s the classic buffalo sauce or sweet and tangy sauce, ask yourself can I eat a dozen wings in this flavor. If the answer is yes, then it passed the sauce test. Let’s start with the chicken wings. I suggest you buy fresh chicken wings not frozen. You normally pay more for fresh wings but you get what you pay for. You tend to get meat discoloration in frozen wings. Nobody wants to see that. Also, only air fry chicken wings when it’s thawed out. You won’t have to worry about this when it’s fresh. Chef Tip: It is best to thaw chicken wings in the fridge. Do not thaw them in warm water as it precooks the chicken making the meat tough and dry. Buying fresh also gives you a selection to big and meaty wings. The frozen wings tend to be small. When it comes to air frying chicken wings, you need to air fry them in two stages. Just follow my recipe and you’ll have the best chicken wings that are crispy on the outside and tender and well cooked on the inside. Chef Tip: Do not overlap the wings in the air fryer. You want all sides of the wings to be exposed so it turns crispy. If needed, you might want to flip the wings halfway through cooking. When it comes to the sauce flavor, everyone has their own taste preference. The most common is the buffalo wing sauce and there is nothing wrong with this flavor. In fact, I love them too. But for this recipe, I made them a little sweet and spicy. Super crispy and tender air fried chicken wings. Mix chicken wings, salt, baking powder, and pepper in a bowl. 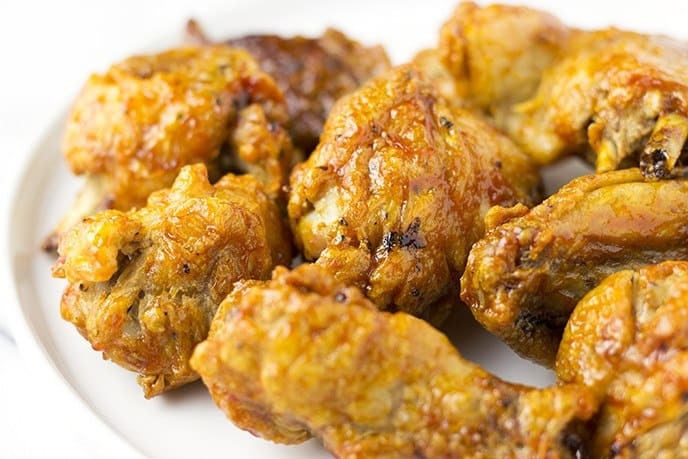 Place chicken wings in the air fryer without overlapping and cook at 250F for 10 minutes. Turn the temperature to 400F and cook for 15 minutes. Optional: You can flip the wings halfway for even crispiness. In a medium heated pan, combine hot sauce, brown sugar, butter, and salt and let it simmer for a minute. In a big bowl add cooked chicken wings and sauce. Toss until all wings are fully covered with sauce. Serve hot. Can I bake these wings instead of air frying? Yes, you can bake these wings but it will take longer to cook. You can bake at 250F for 30 minutes, then switch up to 400F for about 45 minutes. Can I air fry frozen wings? You can thaw out the wings in the air fryer by setting the temperature to 350F for about 10 minutes. Can I use a dry rub instead of sauce? Yes, you can. I’ve air fried chicken wings using a smoky dry rub. Question : Do you cut the tips off and discard and then cut them in 2 pcs.? I just want to make sure I’m doing it as you did. Yes I do discard the tips off and separate into two pieces. Can you use flour instead of baking powder? Would just save me a trip to the store. Yes you can use starch or flour but it will have a thicker coating. The baking powder dries out the skin making it crispy. Do you have to spray the chicken with a little oil before you put in the air fryer? I did not spray oil but you can if you want to prevent from sticking.